How much is a life worth in pixels? More than fifty people were murdered yesterday in what is now the most violent episode in the ongoing Mexican Drug War. Most of the victims were women, some were pregnant. After learning about the horrific massacre in Monterrey, I spent several hours reading the reports coming from México via social and mainstream media. I exchanged messages with friends and family who live there (I went to college in Monterrey and my parents live no too far from there). The Twitter trending topics in México showed anger, desperation and hopelessness. One of the hashtags people often use to report violence in the city, #mtyfollow, was full of messages of repudiation and of people trying to help others find their loved ones. Some of the most retweeted messages were those with the names of the possible victims, as you can see in this chart. The massacre happened only 140 miles south of Texas in one of the largest metropolitan areas in North America. Yet, as Nancy Baym put it, the American twittersphere was mum. Why? In part, I think, because most of the news websites in the US were ignoring the event. One could understand the lack of coverage in the first few hours. The news coming out of México were talking about “only” four deaths, so it is possible the events might not have caught the attention of the American news websites at first. However, ten hours after the attack the official number was already above fifty victims, with some reports as high as 61, yet sites like CNN.com gave little attention to the story. The link to the article of the massacre was buried among articles such as one about actress Rose McGowan’s childhood. Frustrated by this, I decided to get a more objective assessment of the coverage by counting the number of pixels different news websites were assigning to the story of the massacre. I know web designers put a lot of work into every single pixel on the screen, especially of high-traffic websites. Visitor’s attention is scarce and every pixel counts. So I took screenshots of the front pages of some of the major news websites and calculated the amount of screen real state assigned to the story of the massacre. For example, the the New York Times, gave the story 291×11 pixels, a mere 0.27% of the screen real state (in a window size of 1439 x812 pixels). CNN gave it even less at 191×10 pixels, representing 0.16% of the screen. But what about other websites? Did any other websites in the English-world gave it more space? Yes. Read on. I decided to look into non-American websites. If my calculations are correct, it turns out that Al-Jazeera and The Guardian alone gave more pixels to the story than CNN, the Washington Post, FOX News, the Wall Street Journal, the New York Times, MSNBC and the Houston Chronicle combined. Americans might be better off getting news about their southern neighbor from a British or a Qatari website than from many of the US ones. The two exceptions were the LA Times and the Huffington Post. They both gave more pixels to the story than any other news source I analyzed. CNN was at the bottom of the list though. Click here for a slideshow of the websites I analyzed. 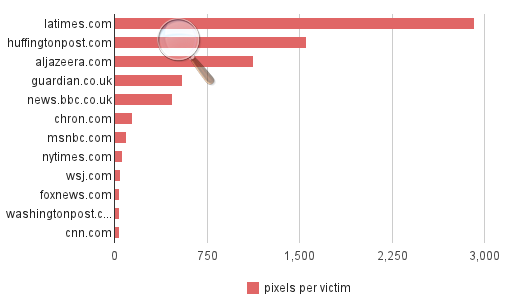 To summarize my results, I generated a ranking of the number of pixels per victim each news website devoted to the massacre. Yes, this issue is much more nuanced than pixels per victim, and I am not a journalism expert but I hope it can help start a discussion (or continue an existing one). If my calculations are correct, CNN devoted 38 pixels per victim, 76 times less than the LA Times which gave 2,920 pixels per victim. The LA Times’ article on a senate report on how the “U.S. can’t justify its drug war spending” (there are many more articles about this). The NY Times story on how US-officials “allowed nearly 1,000 guns to flow illegally into Mexico” (also check this campaign to stop gun smuggling). Chomsky’s excellent synthesis of the whole Drug War problem with a historical perspective that only Chomsky can give. If you liked this, follow me on Twitter or identi.ca. Great analysis/article, and idea for analysis. I understand the frustration that comes with being ignored internationally – NZ suffers from it as well – although we don’t have anything like this conflict going on. I don’t understand the conflict fully but it seems to me that North America is very intertwined with it in terms of geopolitics, so it is especially poor form/irresponsible to see how it’s being ignnored. I hope your friends and family are safe. Thanks for stopping by Tessa. NZ is definitely ignored by the US media as well. Is it being ignored in the Australian media too? This was a superficial analysis just based on the front page of a handful of websites. It would be great to have a tool to crowdsource the analysis and find the different biases of news sources across time and topic. This is a great piece Andrés, thanks for doing it, and for posting it. BTW I don’t think NZ is to Aus as Mexico is to the USA! We have our own funny little sets of relationships; and a shifting sense of who does or doesn’t count as “neighbours” geographically. In general you have to choose your news outlets to get much international news, as it certainly doesn’t occupy a central place in mainstream TV news. I was thinking about that the quality of the information. For example, You can put in the same number of characters Information with different qualitiy.You can apply the same in the pixels? Eduardo, agreed. Pixels are superficial metric to of attention. A better analysis would include the quality of info of the into. Quality is a bit harder to assess though, but it’s definitely worth trying. The other metric that is of interest is “total time of front-page display of news story.” For instance, if CNN rotated it on for 20 minutes, or if the Guardian had it front-paged for 4 hours. Don’t want to generalise but kind of have to here I guess (yes this is just my impression and therefore anecdotal) but from my experience you are generally better off having at least 2 international sources available for world news that are from outside the US. A lot of international issues simply do not happen in the media here. Coming from Germany I feel very spoiled when it comes to getting a solid overview about international issues for example on the evening news. That simply does not happen here on a lot of channels. To get information about, for example, the election day in an African state you pretty have to turn to other news outlets. And (again this is anecdotal) in my circle of friends and acquaintances this is also not requested or missed at all. I find that highly disturbing. It would probably please the perpetrators of these atrocities immensely if their horrors took center-stage across the world’s media – it would be a perverse badge of honor for them, inflating their own sense of infamy and “status”. No the finer point of the article has not gone unnoticed. I understand and sympathize with the issues the article underscores; the failure of the war on drugs (in mexico and abroad), the immense costs of that failure, and perhaps how the media of mexico’s northern neighbor, in quietly ignoring the resulting causalities of a deeply flawed policy, also implicitly perpetuates the continuation of bad policy by ignoring its outcomes, and by extension failing to challenge those supporting poor policies, which, perhaps ultimately reflects a deeper problem within mainstream mass media in failing to question its politicians’ policies. Yet, even if I do see the absurdity of the war on drugs for what it is, and find the mass incarceration rate in the country (in large part due to non-violent drug crimes) ludicrous, I find the cartels’ mass slaughter of people (including women, some pregnant, and children) orders of magnitude more obscene – simply, egregiously reprehensible acts of depravity. As much as I may admire Noam Chomsky, I have serious doubts about the frequently espoused theory that responsibility for the bloodshed in mexico is rooted in the usa’s insatiable appetite for drugs. The entire rationale supporting that idea is predicated on the belief that it is somehow understandable if people kill for money. While this may not be PC to say, in mexico’s northern neighbor, you won’t find drug consumers killing each other to obtain their drugs on a scale remotely approaching the bloodshed in mexico. The responsibility for all those death’s in mexico rests squarely with the perpetrators of the killings who have made an internal ethical and moral choice to value money more than the human lives of those they butcher…gruesomely (on a scale and in ways suggesting they have passionately embraced their perverse valuation). If we subscribe to the idea that valuing money over lives is an intrinsically integral part human nature, then how can we condemn corporations for acting and operating in a manner bereft of any ethical considerations, aside from seeking and ensuring profit, just as narco cartels, ablaze with bloodlust, zealously and ruthlessly protect and seek to preserve their financial interests? If we excuse the narco cartels, why not excuse the united fruit company? Are we to believe placing profits above all else is only objectionable if the profit-seekers work at a corporation, wear a suit and tie and are an alum of an expensive university, but somehow mass-slaughter is excusable if exercised by uneducated sicarios fighting over smuggling routes? Are we to believe that economic conditions in mexico are so bad that engaging in the drug trade with its extremely high mortality rate is the only viable choice that makes sense? Mexico may not be the wealthiest nation, but it’s not close to being one of the poorest; it has and will continue to experience sustained economic growth in spite of the misguided drug war. Since the above article was written, people have begun returning to the places that became veritable ghost towns at the height of the war – thankfully things seem to be modestly improving.